We are at a pivotal point in history and Symantec is doing its share in the transition to a low-carbon and more sustainable future. At a corporate level, we work to reduce greenhouse gas emissions, reduce product packaging, partner to leverage our collective impact, and engage our employees in protecting the environment. As we count down to Earth Day on April 22, we’re spotlighting “Choosing Green in 2019”. This yearlong campaign of environmental sustainability awareness, challenges, and initiatives encourages employees to take part in our environmental sustainability efforts and provides education and ideas for individual actions. A focus on the environment not only supports Symantec’s business objective to create a secure and sustainable future—it contributes to the urgent action needed to combat global climate change and other pressing environmental challenges. 7. Water for all. Employees in our Mumbai office recently volunteered with Planet Water Foundation to celebrate World Water Day. Volunteers built a much-needed water tower for students at Government Secondary Ashram School in Urse, India. Watch this quick video on Twitter to see how excited the students are about having clean water. 6. Lights out! On March 30, Symantec joined with companies and individuals around the world and turned off our lights as part of Earth Hour. Employees and their children in our Saudi Arabia office also volunteered with Solar Buddy to assemble easy-to-operate solar lights for children living in energy poverty. 5. Less meat, less heat. Last October, we piloted our first Less Meat Monday. Beef production requires 20 times more land and emits 20 times more greenhouse gas emissions than common plant-based protein. Consuming less meat is a simple way to make an impact and we’re thrilled to be rolling out Less Meat Mondays beginning April 8 at our Mountain View, CA, Culver City, CA and Dublin, Ireland cafes. 4. Ask a Sustainability Question. Do you know if cloth or compostable diapers are better for the environment? How about what ‘printed on Forest Stewardship Council (FSC) certified paper’ means? Through a new initiative, employees can submit a sustainability question to our in-house experts via a button on our intranet on all things choosing green. 3. We’re planting more trees! In 2018 we planted 2,600 trees with One Tree Planted in areas devastated by natural disasters, impacted by disease, or over-exploited for commercial gain. With 80 percent of the world’s forests destroyed, we’re asking employees to buy one tree for $1 to support important reforestation projects around the world again this year. You can plant a tree with us here! 2. It’s the Little Things. We’re continuing to challenge employees and partners to make simple changes in their everyday life to help the planet with our “It’s the Little Things” effort. Will you use reusable shopping bags or turn off electronics when leaving the office this month? 1. Celebrating Earth Day. 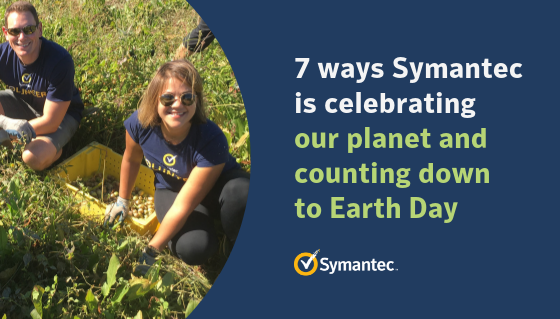 From the 10th annual Green Fair at our Mountain View headquarters on April 18, to learning about bee keeping in Dublin, Ireland Symantec is excited to celebrate Earth Day! If you’re in the Mountain View area we invite you to come to our Green Fair (see flyer below), and bring old cell phones, computers and any e-waste with you to be recycled.